THE EYE IS DRAWN TO A HYPNOTIC, METALLIC VARIATION ON THE HOUSE LOGO BY HAJIME SORAYAMA, THE JAPANESE ARTIST WHO COLLABORATED WITH THE ARTISTIC DIRECTOR OF DIOR MENSWEAR ON BOTH THE COLLECTION AND THE SHOW DÉCOR. 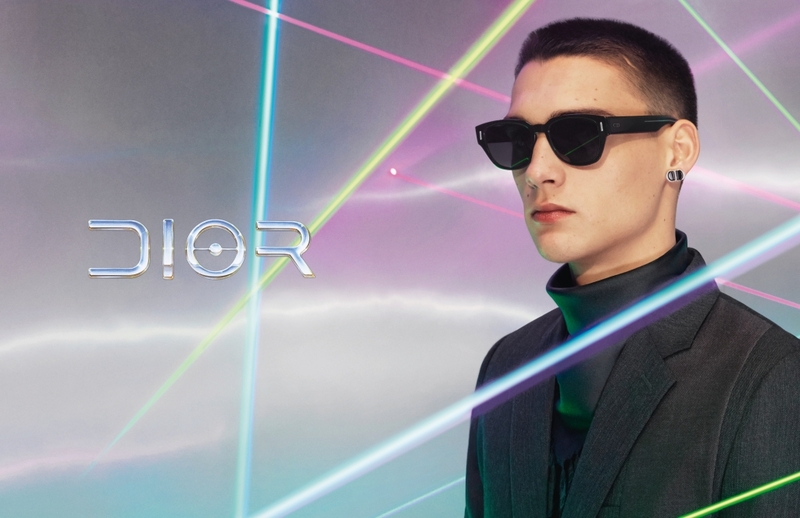 INTERTWINING COLORED LASERS REFLECT ON METALLIC WALLS, SCULPTURALLY ILLUMINATING THE CREATIONS IN THE PRE-FALL 2019 COLLECTION AND INTERACTING WITH THE SHIMMERING EFFECT OF THE CLOTHES. 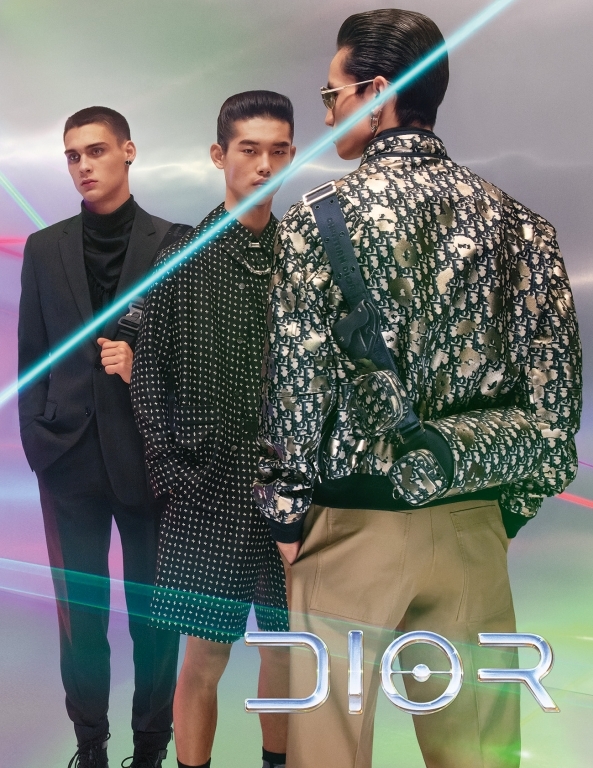 “I WANTED THE CAMPAIGN TO CATCH THE ENERGY OF THE TOKYO SHOW, WITH THE AMAZING LASER LIGHTS OF THE FINALE”, AFFIRMS KIM JONES, ARTISTIC DIRECTOR OF DIOR MENSWEAR. 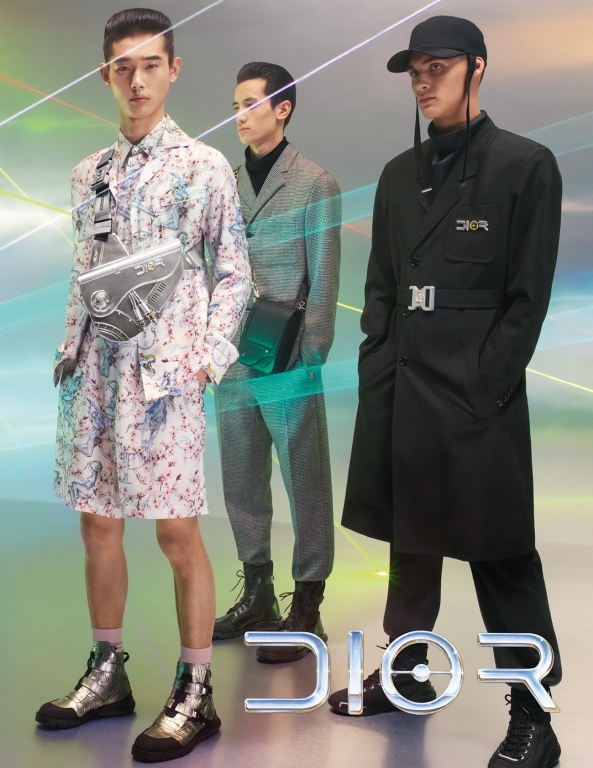 THE CAMPAIGN’S RETRO-FUTURISTIC SPIRIT CAPTURES THE ELECTRIC SPECTACLE OF KIM JONES’ SHOW PRESENTED IN TOKYO ON NOVEMBER 30TH. 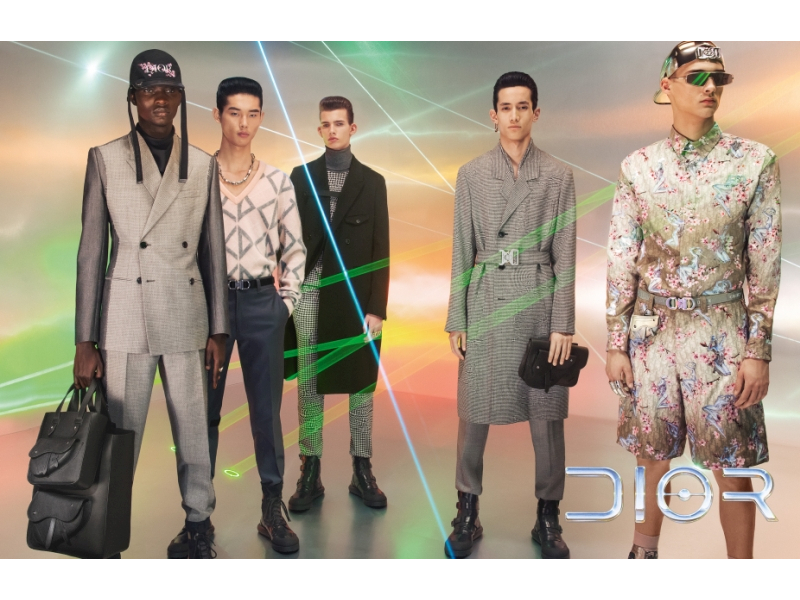 THE SPECTACULAR SHOW — SET TO THE RHYTHM OF IRIDESCENT RAYS PROJECTED ONTO A COLOSSAL GLEAMING ROBOT SCULPTURE MADE BY HAJIME SORAYAMA ESPECIALLY FOR THE EVENT — LIFTED THE VEIL ON THE HOUSE’S FIRST-EVER MEN’S PRE-FALL COLLECTION AND ITS JAPAN- AND ANDROID-INSPIRED MOTIFS. MODELS POSE AS A LIVING TABLEAU, INDIVIDUALLY AND COLLECTIVELY EMBODYING THE SPIRIT OF THE TIMES IN A UNIQUE WAY — A CELEBRATION OF DIOR HERITAGE AND OF ULTRA-MODERNITY. THIS NEW CREATIVE HORIZON, WHICH REDEFINES THE FRONTIER BETWEEN FASHION AND ART, IS AS MUCH A JOURNEY THROUGH THE JAPANESE CULTURAL LANDSCAPE AS A FRESH EXPLORATION OF MONSIEUR DIOR’S STORY. 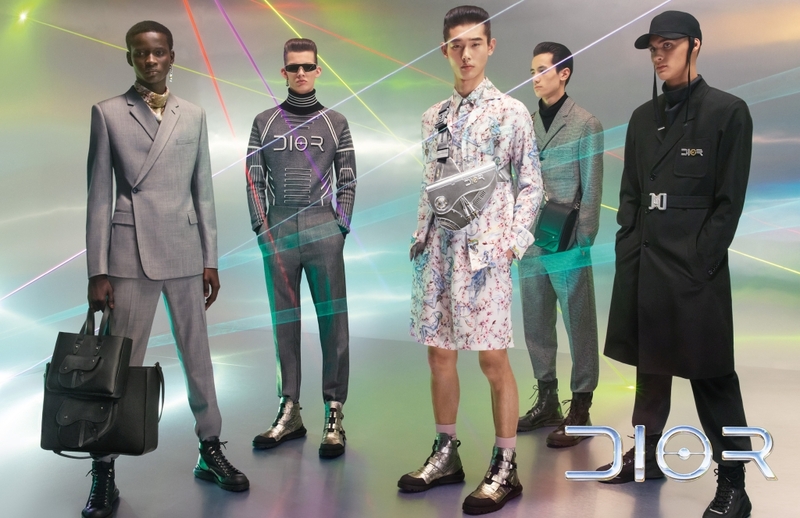 POPULATED BY HUMANOIDS, WITH SAKURA CHERRY BLOSSOMS INTERMINGLING WITH HOUSE CODES LIKE THE DIOR OBLIQUE CANVAS, THE COLLECTION CAME INTO ITS OWN IN A SPECIAL SCI-FI ATMOSPHERE WHERE THE FUTURE HELD A SENSE OF ROMANTIC OPTIMISM. IN ITS MIDST WAS THE ICONIC MEN’S SADDLE BAG, REVISITED IN POLISHED METAL. A LIMITED-EDITION COLLECTOR’S PIECE – A SPELLBINDING EMBLEM OF THIS LUMINESCENT DREAM.